Gutters are not glamorous. Few homeowners brag about their new gutters. That being said, they serve a critical function to your home’s well being and it is important to know when they are functioning adequately and when they need to be replaced. Drips – When water is dripping from a seam, corner or center of the bottom of your gutters. 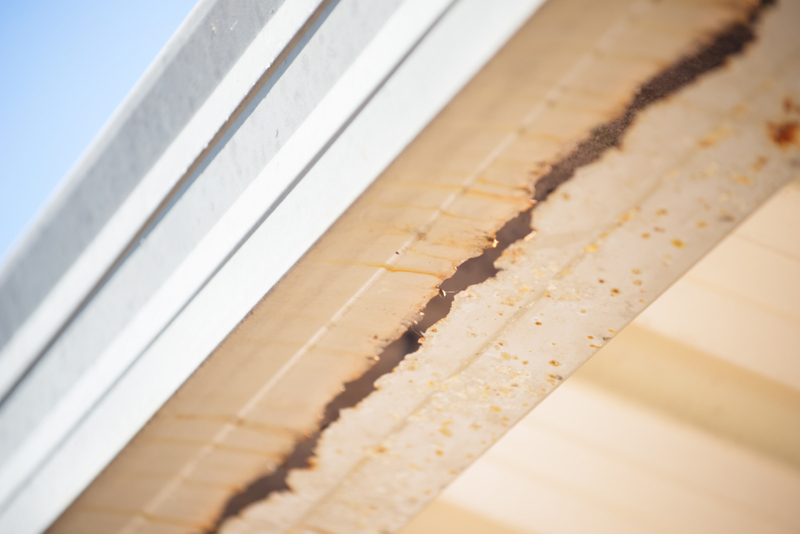 Rust – The final visual sign of needing to replace your gutters is rust. Yes, this is obvious, but often the signs of a needed change are right in front of us. Water dripping from a gutter is one of the most common signs that its time to replace them. However, there are drips and then there are drips! A common type of drip that does not necessarily signal the need to replace your gutters is a drip from water running off the outside of the gutter. If the water you see is either from condensation or simply rainwater that fell on the top edge or side of the gutter and continues to drip off after the rain stops, in and of itself this is not indication of the gutter’s lifespan being over and is not a problem. If the water is dripping from a seam, corner, or center of the bottom (without any drip lines coming from above), there is likely a functional problem behind the drip. By functional I mean that there is either a loose seam or a hole. While a single trouble spot might be best remedied with a repair, multiple locations with drips are usually a good indicator that the gutters are starting to show their age and it’s time to consider replacement. Again, as with drips, overflow can or can not be a sign of gutters being beyond their functional life. Without other clues being visibly present, for an absolute answer you may need to ladder up and look inside. If a lot of debris or sludge is seen, your gutters may simply need cleaning. Similarly, if most of the overflow is next to the downspout, you might just have a clog in the spout. However, if the gutters are relatively clean, this can be a sign that the gutters are mis-graded or sagging and pulling away from the fascia board or rafters. While mis-graded or sagging gutter can some times be corrected, widespread overflowing from this can be a sign it’s time for replacement. New gutters provide the opportunity to install at the proper grade. Often, a house settles over the years, turning once properly graded gutters into ones that don’t flow in the proper direction. Also, over time, the boards behind the gutters can start to rot, causing the gutters to pull out and sag. The bending and warping from this occurrence usually causes permanent damage to the gutters. The only way to properly repair the rot is to remove the gutters. Dented gutters are easy to spot. There isn’t a lot of mystery involved. Small dents are usually only an aesthetic problem and cause no functional problems. Water can continue to flow to the downspout for proper evacuation. If a dip in the bottom of the gutter is created by the dent, it could eventually turn into a rust spot (see below) and require a section of gutter to be replaced. But if you can live with the visual aspect of the dent, it makes sense to wait and get as much life as possible out of the dented section. Large dents, on the other hand, can often be the sounding of the death knell for a gutter. Whether from falling tree limbs or delivery trucks backing into them, they can seriously affect the gutter’s ability to function properly. They can be an obvious location for overflow, drips, or bottom holes. Sometimes, as a result of whatever violent activity caused the dents, there also could be other damage to the roof, eave or siding. In such cases, in addition to gutter replacement, you may find your self needing other repairs as well. Whether to replace all the gutters or just a specific section of gutters will be a decision based on the age and condition of the entire gutter system. As with most projects, small jobs are disproportionately expensive so you might find that for not too much more, you can have your entire gutter system replaced versus just one or two gutter runs. The final visual sign of needing to replace your gutters is rust. As with the other signs above, the extensiveness of rust can be the determining factor as to whether to repair or replace. A single spot can simply indicate an isolated problem – maybe a scratch that acted as an entry point for the rust or a low spot that collected a little too much water. But if you observe multiple rust spots, particularly on various gutter runs, chances are that the rust is widespread and the end is near. Gently scraping the spot with screwdriver or similar hard item can tell you whether you are catching the rust in time so that it could be rectified with some wire brushing and repainting or if the metal is thinning and flaking and in need of replacement. If any of these signs of needing to replace your gutters is apparent to you, or if you aren’t certain, please do not hesitate to contact us. We will gladly have one of our staff give you an opinion. Call us today.